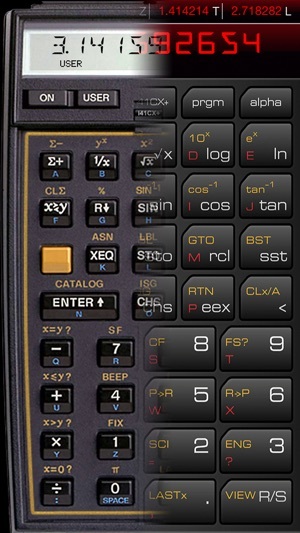 i41CX+ is an advanced programmable and expandable RPN scientific calculator with a virtual thermal printer/plotter and workstation-class CAS capabilities that is far beyond a mere replica of the original. 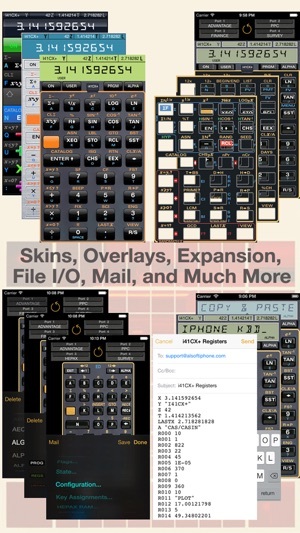 In addition to being functionally equivalent to the world-renowned HP-41CX and providing access to its entire library of modules and programs, i41CX+ is enhanced with iOS and hardware features, keyboard overlays, rich set of import and export capabilities, traditional and upbeat diverse set of skins, complete color control, iCloud support, and much more. The i41CX+ CAS is a full implementation of REDUCE. It's like having Mathematica or the computational engine of Wolfram Alpha in your pocket and, best of all, it runs natively so no internet connection is required. 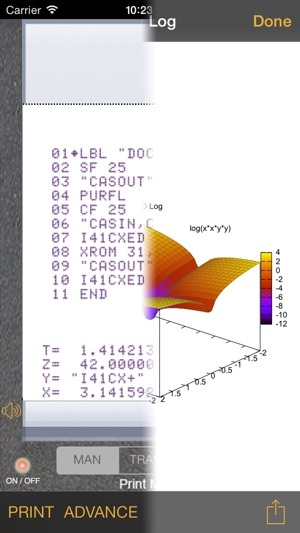 The CAS is fully programmable and provides the ability to reuse previous results in computations. 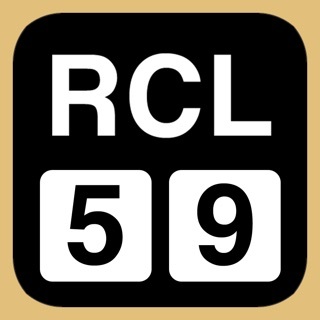 Moreover, the CAS has full access to the calculator registers so it is possible to combine RPN programs with CAS programs. This is the finest and most powerful scientific/engineering/financial calculator for iOS devices bar none. A comprehensive FAQ and Mini-Manual are available at http://alsoftiphone.com/i41CXplus. Please don't hesitate to use the "Contact Us" link there if you cannot find the answers or information that you seek. Thank you. • iOS 11 compatibility fix. 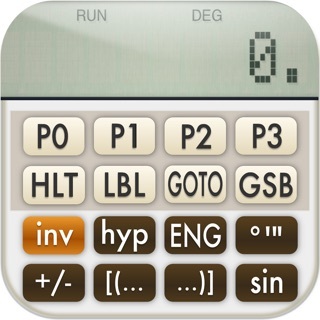 The HP41cx+ calculator uses Reverse Polish Notation (RPN) which is an absolute must for me. The HP41cx+ program by Antonio Lagana faithfully replicates the original HP41 and adds all the bells and whistles which were later developed for the calculator all in one package. 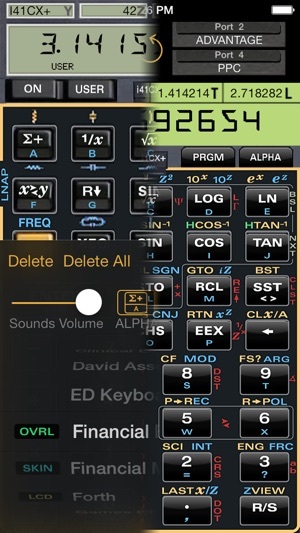 Not only do you get the fabulous HP calculator but you get all the overlays, the ability to run a tape with graphics, the extra memory, all the programming functions, the extreme precision and RPN. 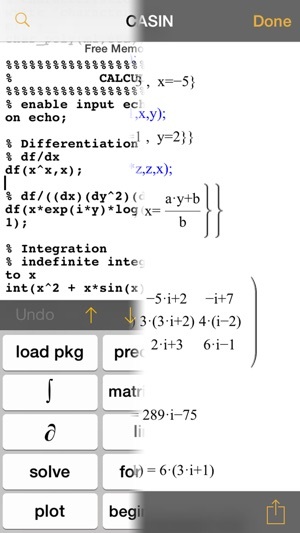 This program yields an excellently fully functioned, easy to use calculator. It is a joy to use! I cannot rave enough about the i41CX+ app. I have a real hp41CV from college and grad school days (mint condition). I use it rarely so that it doesn't wear out. First HP I owned was a model 67 and I was hooked. 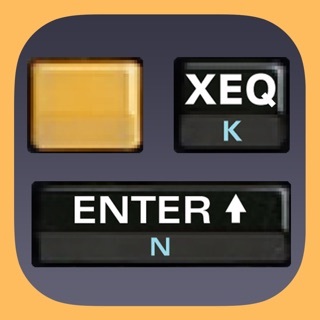 This 41cx app keeps the entire 41 product and accessories, and then some, in my pocket. Couldn't be more happy with the performance and user experience. Well done !! Please keep it going. It's bad enough HP has abandon these gems. 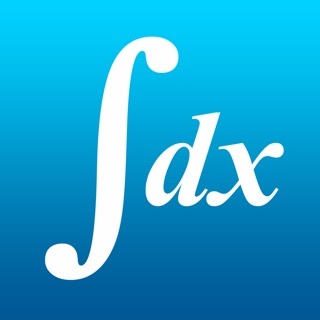 I'd like to know that this app will remain for years to come. Thanks for the great work. The emulation works perfectly. Bells and whistles are available but don’t interfere with the functionality. I haven’t tried any of the bells and whistles so I can’t speak to their utility. But I am happy to testify that the full functionality of my beloved old Hewlett-Packard calculator now runs flawlessly on my iPods and iPads. No doubt it works on an iPhone also, but I don’t use an iPhone. Thank you to the developer for this gem.